Again, nothing but ridicule. Do you have any facts? You totally ignored the part of cloud formations reflecting solar radiation back into the cosmos which has much more energy than long wave emittance from the earth. "Therefore, the changes in cloud cover and thickness from the changes in CCN induced by clear‐sky ion‐induced nucleation changes during both the solar‐cycle and centennial‐scale changes in cosmic rays should also be of order 0.01 W m−2. Even including the feedbacks, this is two orders of magnitude too small to explain the changes seen in cloud cover [Svensmark and Friis‐Christensen, 1997] or to be a significant contributor to present‐day climate change." There is so much contradictory information out there. I guess I'll stand down on that one. Given that you are yet to make a claim of scientific merit, that's the most sensible thing you have said. It doesn't have to be scientific to make sense. Science often adds a smoke screen. Did you see my post about the forest in melting glacial debris. It was clearly warmer when the trees grew, carbon dated at 4000 years old, and carbon dioxide was below 300 ppm. Again, if more CO2 causes warming, then less CO2 would cause less warming yet trees grew where glaciers consumed them. And what caused the glaciers to grow. Not CO2. Something other than CO2 caused the warming and cooling which debunking CO2 as an important contributor to climate change. Talk about volcanoes or atmospheric particulate if you want, but there is no taking around this fact. Unfortunately you just pick stuff that has no bearing on present climate issues or has no scientific veracity. If you read any science at all you would not be posting what you have. It doesn't have to be scientific to make sense. Then it makes no sense. Science often adds a smoke screen. This what deniers of climate science keep claiming. Did you see my post about the forest in melting glacial debris. It was clearly warmer when the trees grew, carbon dated at 4000 years old, and carbon dioxide was below 300 ppm. So what? Again, if more CO2 causes warming, then less CO2 would cause less warming yet trees grew where glaciers consumed them. This is not coherent. And what caused the glaciers to grow. That's called a cooling planet. Climate science has covered these issues in hundreds of different papers over the years - there is no mystery..
Not CO2. Something other than CO2 caused the warming and cooling which debunking CO2 as an important contributor to climate change. Yes, and these issues can be read about if you choose to read science rather than make silly claims. Talk about volcanoes or atmospheric particulate if you want, but there is no taking around this fact. ??? Author is perfectly right, solar and wind will not winner. The Volcanoes one is a firm favourite of the Climate Change Denier there's a Kon-spiracy Brigade. A fairly typical claim - one Volcano puts out more CO2 than the whole of Humanity. Published scientific estimates of the global CO2 emission rate for all degassing subaerial (on land) and submarine volcanoes lie in a range from 0.13 gigaton to 0.44 gigaton per year. Weather balloon data also, If CO2 captures more long wave radiation the the atmosphere should be warming. No sucj warming has been found. Why. Chris you would have an easier time arguing the veracity of the virgin birth with an Evangelical than provide facts to a member of the Church of Warming. The "scientists" Red worships are little different than the "educated " clergy of the monarchies who provided legitimacy to the king's right to rule by divine providence. The clergy then got to share in the plunder of the peasants by the crown and the king was able to avoid the messy use of the sword to take away the people's property and freedom. There is one flaw in your post above. Chris isn't actually providing any facts - its just nonsensical claims. Feel free though to pitch in and answer the question I keep asking him about the radiative forcing effect of his claimed 12.86 year 'Jupiter' cycle. 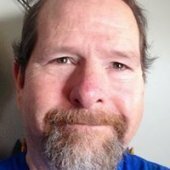 Has it ever dawned on you that another factor affecting climate in this region may have caused that occurence (if it occured as it seems to be exclusively reported on type (Kon-spiracy websites)? A good example might be a temporary regional change in weather patterns that bought warmer weather to the region causing a localised retreat of the glaciers. Possibly the tail end of the wet Sahara period which saw far more wet warmer weather moving from the tropics into North Africa and Southern Europe. Here is the current science on our rapidly increasing global clouds coverage. Clouds reflect sunlight, and heavy cloud cover cools the planet. Clouds are increasing fast, and this will continue for many many years. 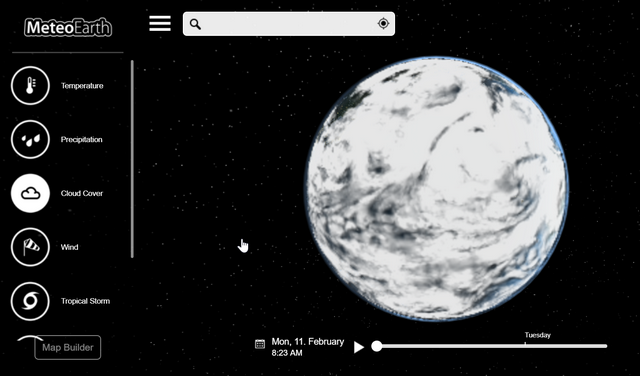 You can see this in real time at http://www.meteoearth.com/ Just click ON the Cloud Cover button, spin the globe, and do the reality check. Why are clouds increasing so much? They are increasing as a direct result of the increasing Cosmic (Stratosphic) Radiation entering the atmosphere. 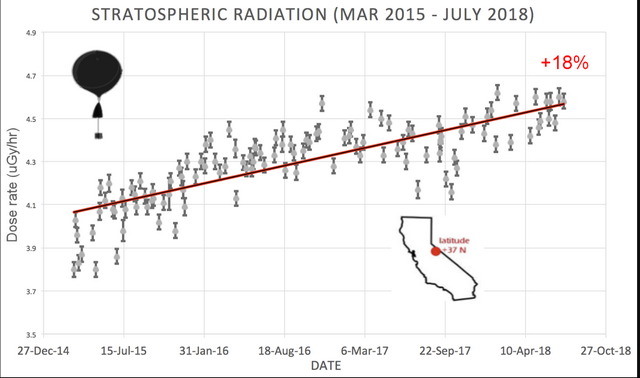 From http://www.spaceweather.com Cosmic Radiation has a tremendous cloud-seeding effect. The result of the ongoing long-term increase in clouds will be global cooling, Extreme precipitation - rain and snow - which will cause floods globally. Global Agriculture will be devastated due to wet/cool fields, lack of sunny days, insufficient UV radiation to prevent mould, and winters that start early and end late. Why is more Cosmic (Stratosphic) Radiation entering the atmosphere? This is a direct result of Earth's weakening magnetosphere (magnetic shield), which is weakening in synch with the Sun's decreasing magnetosphere. 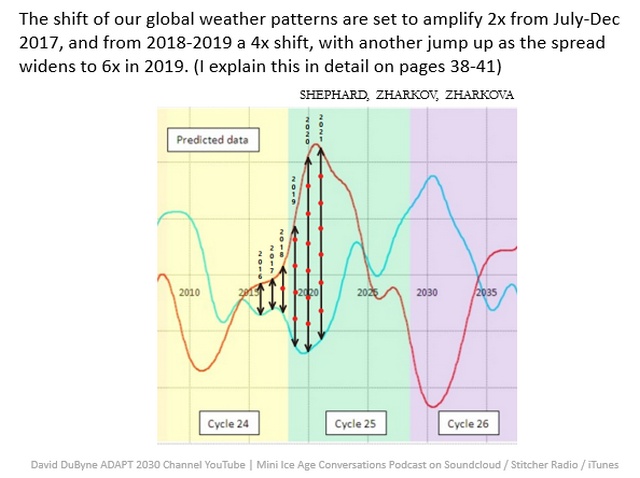 The Sun's internal dynamo is moving out of synch causing the magnetospheric weakening This next chart (predicted years ago by Russian Solar Physicists) shows the intensification of the above-mentioned weather patterns going forward. Note: We are currently on the chart where yellow turns to green. The cloud/cooling effects will intensify well past 2035, as the magnetospheres on the Sun and Earth continue to weaken, due to the dynamo continuing out of synch. 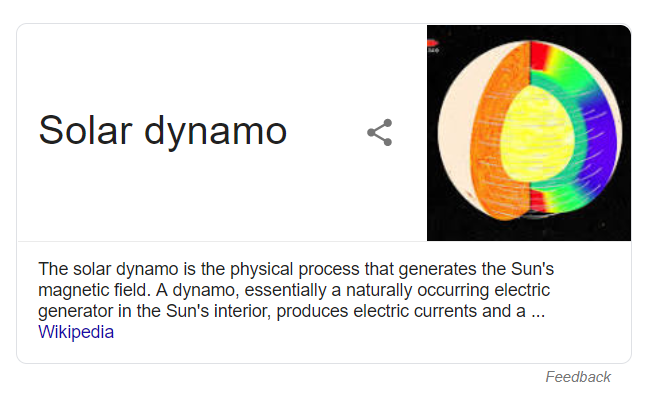 Note: The Solar Dynamo was in synch until 2015. Up to that point we had global-warming. Post 2015 marks the onset of Global Cooling. We are going to repeat the Global Cooling of the 1600's. Summary: This winter with all the "Coldest Temperatures EVER" is just the beginning of something much worse.. There was zero science in your post; just a lot of regularly debunked nonsense being regurgitated. Clouds are, nevertheless, an important factor in climate modelling and we definitely need a lot better data to determine the extent to which they will impact temperature. Aside from any changes in coverage, the types of clouds and their presence in the upper or lower atmosphere can change forcing effects. To provide 2,000 MW of pumped hydro backup needs about 2.4 square km of ponds if completely off river or by using existing streams or reservoirs as one end of the system about 1.2 square km lest say an average of 1.8 + the turbines at .35 square km. i.e. a total of 2-3 square km with the spinning reserve built in. Similarly in 2016 NREL showed that 32% of US electricity can be provided from 14% of US roofs using 16% efficient solar panels.i.e. no land use and almost no transmission losses and no cooling water. As solar panels are now reaching 21% CF and will be 24-26% by 2022 if the 16% panels were replaced by 22% average panels that means rooftop solar would provide 40% of US electricity production from rooftops. I bet there is massive potential for biogas in the USA from organic wastes. In the UK the potential is estimated at about 150TWH (1/6th of current gas usage). I'd estimate several hundred TWH of biogas for the USA. That would provide a significant proportion of the backup needed for intermittent renewables and help deal with a significant waste issue. Unfortunately for you, and whoever brings up Volcanoes/CO2 1) they have no idea how much CO2 gas is spewed out in Volcanoes on land as they massively vary and they certainly 2) have no idea about the MAJORITY of volcanoes spewing out CO2 underwater. So, 3) No one can make ANY claim if humans or volcanoes spew out more CO2. People like you swill this BS up. SO much for "peer reviewed" "Science?" Peer only in religious fervor and blind devotion against basic physics. Geologists and their research say otherwise. Please do, CH4 is completely covered by water vapor. Water vapour is a feedback - it cannot of itself increase temperature unless more energy is added than previously. Then there is that **slight** <<COUGH>> problem that CH4 in the presence of an oxygen atmosphere<<Earth>> oxidizes and turns into water and CO2. You have to be utterly stupid to post CH4 is going to heat 20X more than .... Increased atmospheric CH4 levels affect radiative forcings. It does not matter how much turns to water and CO2 as if the net level continues to increase then the forcing effect must increase. People like you swill this BS up. SO much for "peer reviewed" "Science?" You mean, when you offer nonsense instead? Certainly isn't science. Science is probabilistic That would require use of the scientific method... Science is probabilistic Strange how no one in the climate alarmist crowd ever wish to use the scientific method... Given that whoever you are talking about would not be scientists, they would never need to. When we finally decide to end fossil fuels, they'll be replaced by nuclear. Fission most likely; fusion if it's available. But nuclear is expensive, dangerous, blah blah blah. It's not dangerous; nuclear has the best safety record of any energy source. It's also only expensive due to regulation that, quite frankly, exceeds a statist's wildest dreams. The nuclear we currently know is also a crude first attempt. In the beginning, engineers sought to answer the question, "How does one pack a nuclear power plant into a submarine?" Once they had that, they forked the technology and dropped it into coal plant technology as a heat source. Then they optimized the plants around the nuclear reactor. Then they actually started to standardize the plant designs. The point when they were standardizing - which is to say, the point at which they could have driven all other power out of business - is when crises were manufactured to justify overbearing regulation. What didn't happen was the next generation of technologies. There are multiple ways to build a nuclear reactor and multiple possible fuels. Many are inherently safe and proliferation resistant - the two main concerns with nuclear. We never saw those designs because the political risk was too high. Today, interest in nuclear is reviving. Small, modular designs are starting with proven technology and may eventually incorporate the next generation of nuclear concepts. The most intriguing design I've seen is a containerized, closed Brayton cycle reactor. Yes, that's possible. It's not even difficult, in fact. Only the government stands in its way. If this design happens, it could be the end of renewables, coal, and natural gas. What evidence do you have that the Holos System a) works b) is economical. At the moment it is a dream, "not even difficult". What a joke. 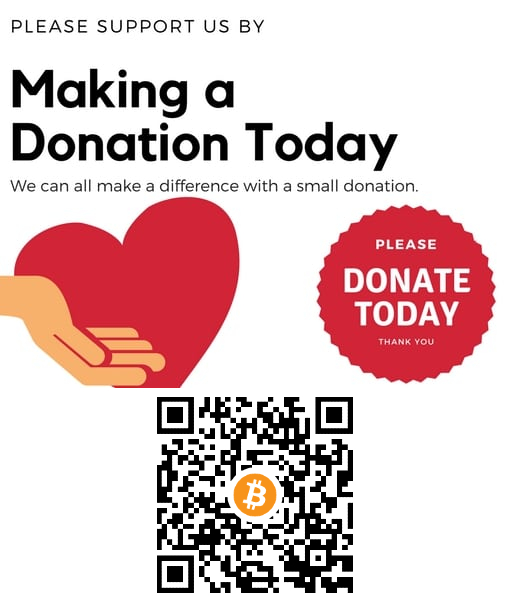 Billions are spent every year on nuclear power and yet still it is more expensive and uses more land and water than an equivalent fleet of wind and pumped hydro, while it costs three times as much to build and operate. but there is 1 TW of wind and solar generating power every day and this year another 160 GW will be added and the next etc.. Wind and solar combined this year will generate more power than nuclear in China, India, Germany, Japan, Spain and the UK. At the current rate of progress that will also be the case in the US within 5 years. Germany, Sweden and Switzerland have agreed to phase out nuclear. The US, UK and France aren't building plants fast enough to replace old plants as they retire, India has slashed its forecast nuclear capacity by 2/3 rds.